Your New Weekly Horoscope for September 25 to October 1, 2016 is available here. The Moon meets Mercury in Virgo today. It’s a good day to be productive. If you are emotionally invested in your tasks you are more likely to accomplish more and feel satisfied that you took the time to get things done. It’s an excellent day for self care and wellness to improve your mind and mood. Learning about healthier nutrition and lifestyle choices is recommended. Relaxed reading of self development and self help books will likely sink in better than usual today. Practicing a healthy activity such as swimming, yoga, or simply enjoying a spa day at home will do you well. Giving others positive compliments is recommended. They can go a long way. Sending out an energy of caring with something as simple as a smile can totally transform someone’s way of thinking for the better. If you’re usually a procrastinator and let your emotions and thoughts impact your productivity, it’s recommended that you do some clearing of your thinking processes with positive affirmations. If you don’t like the type of work you do, or your job, this is a good day to explore your thoughts and feelings to figure out what you’d really feel good about doing. Finding positive reasons to get things done, and rewarding yourself is recommended today. It’s a New Moon in Libra tomorrow. You can read more about it in the Weekly Horoscopes here. For today, I recommend you do a free emotional intelligence test online to see where you can develop a better balance of logic and emotions in your everyday life. Simply google “Emotional Intelligence test.” Have a great day! Learn more about getting your own personalized reading here. 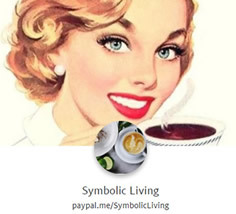 Copyright © 2007-2018 SymbolicLiving.com. Powered by Blogger.